Precious Metals continue to be in a long bottoming process that began last summer. Though many quality juniors have already bottomed and while GDX, GDXJ and SIL probably won’t see new lows, the broad sector as a whole is struggling to push out of this long bottoming process. Traders always say price is all that matters and who cares about fundamentals or the why. However, the most astute traders and investors look beyond a simple tool or single sphere of analysis. With respect to precious metals, negative real rates and the direction of inflation are the driving forces. Deflation is a catalyst for precious metals because policy makers react by suppressing real rates. Rising inflation is a catalyst and especially when it causes real rates to go negative or more negative. I will explain why this could be the catalyst for the revival of precious metals sector. Commodities generally move together but some lead and some lag. In a deflationary catalyst situation, precious metals and gold specifically lead the rest of the sector. Examples of this include but are not limited to 1931, 2000-2001 and 2008. Yet there are instances of precious metals lagging after major bottoms. The best example is 1976. A smaller example is during 2004 when precious metals corrected but commodities kept moving higher. We’ll get to 1976 later but first lets examine the present. The chart below plots the major commodity groups with the sector as a whole (CCI) at the bottom. Note how the CCI and all groups (except precious metals) peaked from the end of February 2011 to April 2011. Yet precious metals didn’t peak until around Labor Day 2011. Today we see that the CCI has clearly broken out of its downtrend and ended its bear market. Note how the 80-week moving average, formerly resistance has become support. It makes sense that because precious metals peaked last in 2011, they will lag the initial recovery of the commodity sector. This is something that occurred at during the 1976 bottom. This next chart plots gold and the CRB index, which is today’s CCI. 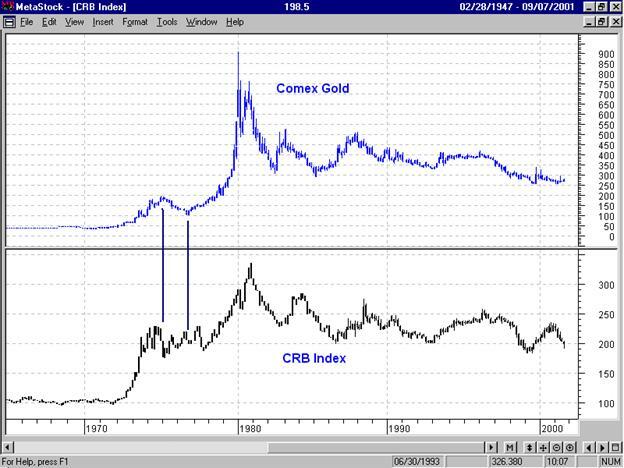 The CRB peaked before gold in 1974 and bottomed not too long after gold peaked. When gold bottomed in summer 1976 the CRB was trading well off its bottom. After gold bottomed it quickly regained its leadership. Circling back to the present, there are technical and fundamental reasons why precious metals are lagging and why that could continue until a final bottom is confirmed. 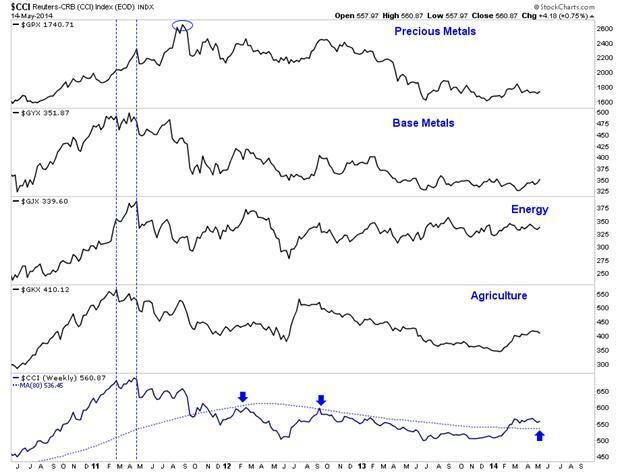 Precious metals peaked months after the rest of the sector in 2011. Thus, they should lag the initial recovery. On the fundamental side, rising inflation appears more likely than deflation. CPI and PPI have ticked up in recent months. May’s PPI was at an 18-month high. In addition, credit growth in the US which declined from 5.7% in summer 2012 to below 2.0% at the end of 2013 has since increased to 4.0% and a one year high. Furthermore, Reuters reports that the Fed said banks eased their commercial lending standards in recent months and this resulted in higher demand for credit. Banks also eased lending standards on consumer credit and auto loans. Prices are starting to tick up, credit growth is picking up and banks may slowly be easing lending standards on consumers. We can see a potential catalyst which could help drive a sustained recovery in precious metals. Over the near-term, the sector remains mired in a long and arduous bottoming process. Gold and Silver were firming to start this week but both were rejected at their declining 50-day moving averages. Meanwhile, the stocks haven’t done much of anything. The onus is on the bulls as the short-term prognosis continues to be bearish. Nevertheless, we are excited. First, we see a potential macro catalyst evolving which is supportive and gives us more confidence to buy. Second, we know that lower prices in the coming weeks will provide a tremendous, low risk opportunity to put more money to work. As I wrote last week, I am looking at JNUG (3x long GDXJ) as well as several juniors I believe have exceedingly strong upside potential over the coming quarters and years. In any event, be patient over the coming weeks and let this final selloff run its course. If you’d like to know which stocks we believe are poised to outperform after this next low, then we invite you to learn more about our service.